You have 1240 characters. Don’t forget to add important and relevant keywords in your description to improve your iTunes app page and optimize your SEO. Your app's last version was released on July 02, 2010. It is important to regularly update your app. Best practices recommend to update your app every 4 to 6 weeks. This means fixing reported bugs, improving existing features, launching new features etc. Keep an eye on users' feedback. The next great features may already be asked by many users. It’s not the “difficult quiz”. It’s not the “really hard quiz”. 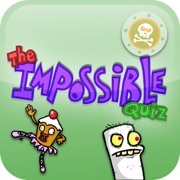 It’s the IMPOSSIBLE QUIZ! The internet sensation with over 50 million plays is now available in a new ginormous size that fills up your living room! And by living room we mean your snazzy and shiny iPad! inXile’s Sparkworkz, creators of Line Rider and Fantastic Contraption, present the highly original internet brain buster, the IMPOSSIBLE QUIZ! Forget the imitations and play the original. Stump your friends with the wacky logic puzzles, then post your genius on Facebook. The rules are simple. Try to complete the quiz by answering all of the “questions”. It may sound easy, but will require quick reflexes, luck, and good old insane logic. While the majority of questions are multiple choice, there are plenty of surprises along the way. The main thing to remember is to THINK OUTSIDE THE BOX! -New HUGE eye bugging graphics for the iPad! -Over one hundred Questions, including classic originals and never before seen mind benders! So how far can you get? Go ahead. Try it. We dare you. Warning: May cause increase in blood pressure, involuntary outbursts, and fits of rage.